Two recently published books should have the attention of anyone interested in the economic policies coming out of Washington and the importance of Supreme Court judges. Today’s media world spends a lot of time speculating about people’s actions and intentions, particularly with respect to someone like the Chairman of the Federal Reserve who is rarely heard from beyond the obligatory twice yearly reports given to Congress. Therefore, I’ve been very curious about Alan Greenspan’s real thoughts. For 18 years under six Presidents he served as Chairman of the Federal Reserve and probably had more impact than anyone on our economy. His new book, The Age of Turbulence: Adventures in a New World, is a rare window into the thinking of someone in Greenspan’s position. It reminded me of why I’m glad to engage in political observations on my radio show. Undoubtedly, we will hear many media personalities claiming Greenspan is wrong in his criticisms of Washington’s recent economic policies. But I enjoyed reading what Greenspan thought, seeing his words—as opposed to hearing how media pundits will rewrite it. For one, he says the Republicans deserved to lose power in Congress because the party didn’t stick with their principles of small government. Greenspan criticizes the President and Congress for overspending and abandoning fiscal discipline. (Interestingly, my Senators from Georgia would always seem to argue back when I wrote them about these spending issues. Perhaps they’ll have more respect for Greenspan and thoughtfully consider words from a guy who knows how the economy works.) As Greenspan notes, the President had several opportunities to help curb out-of-control spending by vetoing pork-laden bills. He didn’t. It was a mistake. Read for yourself this engaging new book. A lot of talk radio and television today say only what their audience wants to hear. Some media outlets have damaged their credibility by being uncritically agreeable with most everything coming out of Washington—especially with respect to fiscal policy. The fact that Greenspan is a lifelong Republican with impeccable credentials means his opinion is worth considering. 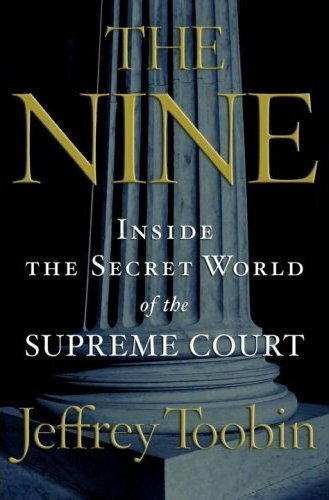 The second important book of note is by Jeffrey Toobin and entitled The Nine: Inside the Secret World of the Supreme Court. It is widely agreed that the President has done a fine job in new appointments to the Supreme Court. But since the Justices are not elected, I’m afraid too many people know too little about them. I was fascinated with this book given that our country is currently debating the merits of international law and how it should or should not affect the thinking of the Justices. I also came to understand that Justice O’Connor, a Goldwater conservative, was disappointed in the current White House and wondered if her vote on Bush v. Gore was one she regretted. The correct answer is “yes”—she does regret it. We live and learn in life. Well, sometimes we learn. After recently serving on a week of jury duty I have a whole new appreciation for what judges endure as they search for focus and facts in a world of smoke and blur from lawyers. Judges are pressed to make decisions that, like all of us, may turn out to be one they wish they could do over. But seldom do we get to hear from judges about anything but their decisions, least of all their regrets. I wonder what they think in what often seems a prestigious but lonely and thankless job. It’s fascinating. I’m sending my copy to my favorite judge Lark Ingram, Chief Judge of the Superior Court of Cobb County, Georgia. She is a fair, thorough, good judge and person. If she’s made a bad decision, I don't know it. If she does make one, I’ll forgive her. Her heart is in the right place. I hope we all pay attention to this very important issue of judges in our country. We need to pray we have people with the fairness and integrity of Judge Ingram in courts all across the country—people who just do the right thing in spite of enormous efforts to bend the interpretation of law or “jazz up the facts.” This is all the more vital as we live in a world where more and more people, it seems, are not ready or willing to accept responsibility for their actions. Keep your eyes open later this month for these two fascinating windows into the thoughts of rarely-heard-from public figures shaping our world today.